Learning a foreign language as a child is like taking a sponge to water. The child soaks up the new words, the accent, the songs, and the nursery rhymes. In contrast, learning a foreign language as an adult is like taking an icepick to one’s brain. Old verbal patterns need to be chipped away. For Spanish, learning to roll “r’s” is a feat to be proud of. Keeping straight the differences between “por” and “para” is another “I did it” moment. And maybe because it is challenging to pick up a second language as an adult, it is all the more rewarding. Definitely, a few tricks prompt the learning. And language immersion programs are a great way to visit a foreign destination, soak up its culture, meet phenomenal people, and start to feel comfortable with the stretching of the brain that language acquisition involves. This past October and November, I visited Mexico, a delightful country that I fear has received a bad and unfair reputation of crime and danger. I flew from southern California to Mexico City, an easy flight of just over three hours. I stayed at Tao Bed & Breakfast in the neighborhood of Condessa, filled with beautiful parks and sidewalk cafes. I toured the capital, mainly with a company called Estacion. Free walking tours were expertly given in English in the historical downtown and in the Coyoacan neighborhood. Additionally, I went with Estacion to the ancient pre-Aztek ruin of Teotihuacan and to the Santo Ring Wrestling show with pulque drinking beforehand. (For information, refer to contacto@estacionmexico.com.mx.) I also enjoyed an upscale food tour in the Polanco neighborhood, also given in English, with Mexican Food Tours. In contrast, I enjoyed another food tour at the San Juan Market, where they introduced me to such delights as fried grasshoppers and Oaxacan cheese. The art and anthropology museums in Mexico City are first rate, with ample English translations of the displays. And the city’s Day of the Dead parade and celebrations transcended language barriers with crowds, shouts, costumes, and pure ol’ revelry. But all along, I knew that I would enjoy the tours and activities more IF ONLY I knew more Spanish. With this as my goal, I ventured onward to Cuernavaca. It is an easy 90 minute bus ride with public busses making this route almost hourly to this city known as “The Eternal Spring” because of its ideal climate. Here, I opted for a two weeks program with ANDERS LANGUAGES, a residential language immersion for demanding adults established in 1998. The casa is a 15-20 minute taxi ride from the town center. The gentleman at the gate ushered me inside the complex of five homes to the one owned by ANDERS LANGUAGES, truly a beautiful casa, complete with swimming pool, luxurious bedroom suites, manicured gardens, and even squirrels playing on the brick walls between the homes. 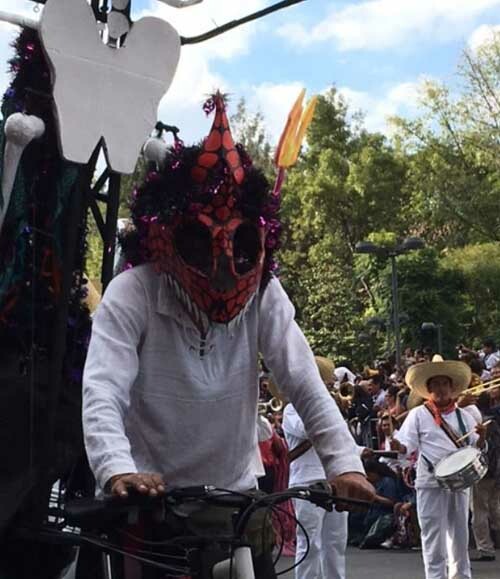 I settled into my room and an hour later one of my soon-to-be instructors came to introduce me to the Day of the Dead festivities that afternoon and evening in town. Esther, my teacher, encouraged me to speak only in Spanish, mainly by playing a deaf ear to any English I flipped over to using. It didn’t take long for me to realize that immersion would be seriously adopted. The next morning I met my morning instructor, Claudia, who masterfully recognized my level of Spanish and plodded me to speak and speak. Her teaching technique relied greatly on asking me questions, encouraging lengthy responses on my part, and then correcting my errors and filling in my lapses. In fact, Claudia might know more about me than some of my friends and family members back home do. As she said, “You may not be fluent, but you are fluid.” Because of the many hours of practice, I learned to keep a conversation going – and going – and going. Typically, my morning began with breakfast with my teacher at 9 a.m. The cook, Hermelinda, turned every meal into a feast. Fresh fruit, herbal teas, scrambled eggs with sausage, and yogart provided a great start to the day. Then one-on-one instruction began, with a brief recess at mid-point, until lunch at 2 pm. Hermelinda adds new dishes regularly and can provide cooking lessons alongside the language instructor. I fell in love with her tortas de cangrejo (crab tortas,) mole con pollo (chicken with mole sauce) and Oaxacan enchiladas. After lunch, I switched instructors to Esther, who reinforced what I studied that morning or expanded into new territory. Whereas Claudia sharpened my speaking skills, Esther emphasized my listening, testing me often for comprehension. We continued our studies until 8 pm, breaking then for supper. After another feast, we played card or board games until past 10 pm. Bedtime brought sweet slumber and even dreams in Spanish. 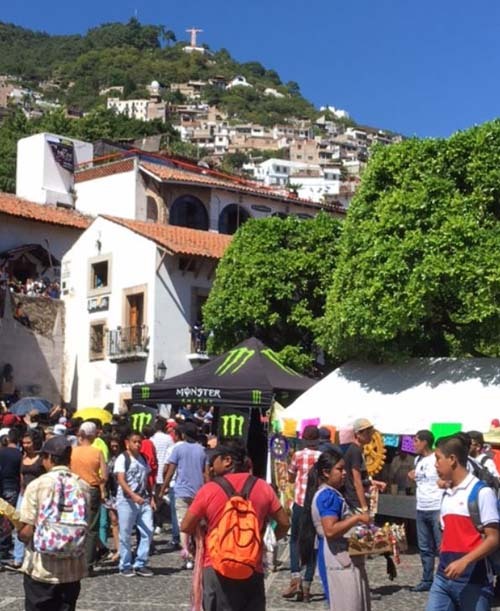 On the weekend, I went by bus to Taxco, a beautiful pueblo known for its silver. It was a great time of the year to begin Christmas shopping with fantastic pickings of jewelry. 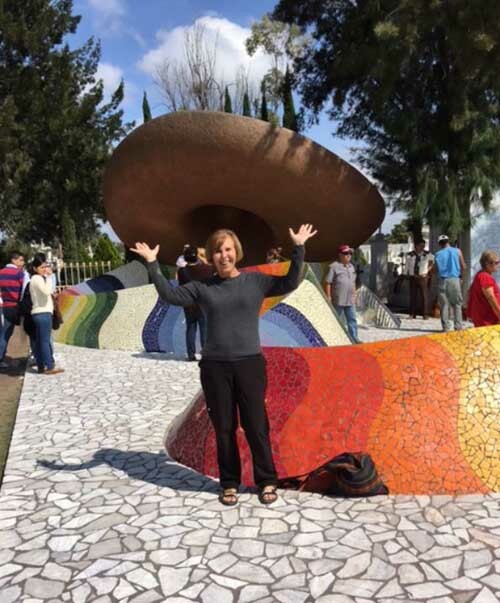 One morning I toured the sights of Cuernavaca under the guidance of Claudia, learning much about Cortez and the early days of this area. On another day Claudia, Esther, another student, and I went to Tepoztlan, a popular tourist destination known for the remains of its temple built on top of the nearby mountain and its exotic ice cream. Supposedly, it is the birthplace over 1200 years ago of Quetzalcoatl, the feathered serpent god widely worshipped in ancient Mexico. At the end of my two week stint at ANDERS LANGUAGES, I was ready to put my language acquisition to the test. I took a seven hour bus ride to Guanajuato. Cobblestone avenues and massive tunnels swirl through this charming town. 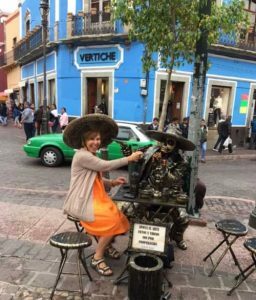 Culture shouts out at every turn, with strolling musicians, theatre productions, Cervantes vs. Shakespeare contests, and museums of many kind (inquisition, art, historical, religious, even mummies.) I stayed at a cozy bed and breakfast inn, Villas Sueno Azul, that was only a ten minute stroll to the town center. 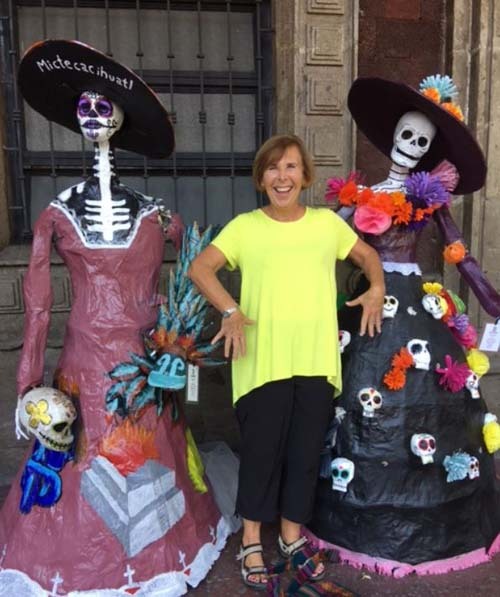 And, best of all, in contrast to my stay in Mexico City, I took my tours in Spanish. I visited churches, shops, silver and gold mines, food factories, a dozen plus museums, and the theatre, soaking it all in from Spanish displays and Spanish speakers. 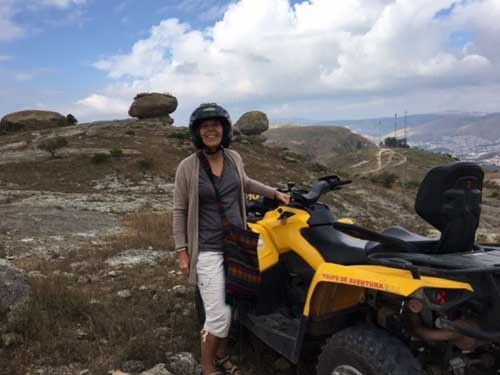 I toured for two days with Israel of Turismo Alternativo who speaks fine English, but I was able to convince him to further my Spanish learning as we hit to the Sierra region via ATV and mountain bikes. (More information can be located from Israel at contact@turismoalternativoenguanajuato.com) “Muy divertido” describes our great fun. I ventured on a ten hour day tour to outskirts of Guanajuato, finding it easy to find tours for day trips run by locals in front of the Theatre Juarez. We went to a women’s co-op in Santa Rosa to learn of their success, in spite of their husbands’ initial doubts, in producing jams and candies when the local mines closed and their husbands lost their jobs. We then visited the town of Dolores Hidalgo, the cradle of national independence. In this city in the early hours of September 16, 1810, Father Miguel Hidalgo y Costilla uttered his famous cry for independence in front of Nuestra Senora de los Dolores parish church. A museum in town chronicles the events of the battle for independence. A highlight in Dolores Hidalgo is the tomb of Jose Alfredo Jimenez. His ranchero-type songs are considered an integral part of Mexico’s musical heritage, and his tomb is a huge cement sombrero extending into a colorful blanket, symbolizing warmth and color to all who visit. Later we visited his birthplace, cathedral, and town square where dozens of ice-cream flavors can be enjoyed (all the way from guacamole to strawberry to mole.) We also visited the Sanctuary of Atotonilco, a church complex and a World Heritage Site near San Miguel de Allende, nicknamed “The Sistine Chapel of Mexico” for its beautiful interior. Last stop of the day was the center square of San Miguel de Allende with its celestial cathedral looking down upon all who visit. Readily, I compared by tours pre-ANDERS LANGUAGES to post-ANDERS LANGUAGES. The tours in Mexico City were informative and very interesting. 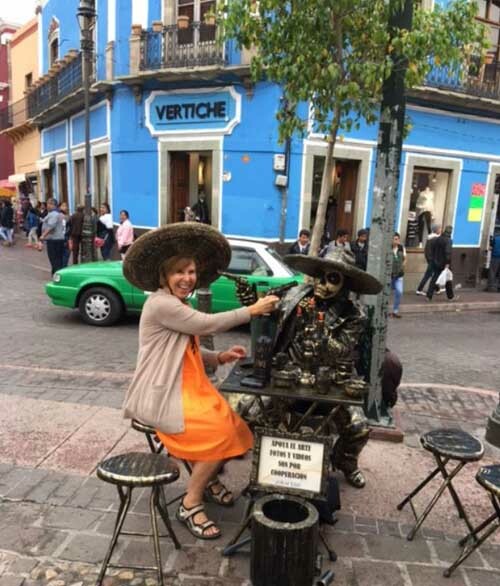 However, I blended into the Mexican culture with my tours in Guanajuato. The reason was easy to understand: I knew sufficient Spanish to take the tours in Spanish, to mingle with the locals and travelers from Mexico, to enjoy theatrical performances in the native language, to shop and barter with ease, and to converse with the personnel at Villas Sueno Azul without hesitation. It is one thing to visit as a foreigner the birthplace of a country’s independence or the grave of a beloved singer. It is something else to be welcomed among natives at these sites. Their tears of gratitude for fallen heroes and their breaking spontaneously into Jimenez’s song “Paloma Querida” (“Beloved Dove”) brings touring to an elevated level. Their wanting to share with me their passion and their memories are the souvenirs I cherish most now that I have returned home. Perhaps ANDERS proved to be the sauce atop the torta. Yes, the sandwich is good, especially when garnished with mashed avocado and a spread made of black or refried beans. The torta’s favorite meats of pork, beef, fish, or chicken add to its flair. But, definitely, the chili sauce sprinkled lavishly on top makes me not leave a scrap on the plate. The sauce brings the torta to a whole new level of “deliciousness.” And, Spanish immersion does this too. It elevates the travelling experience into a delectable feast.